Mia Katz/Contributing Photogeapher Students, faculty and families walk around Binghamton University’s campus on Sunday afternoon to help raise awareness for individuals battling eating disorders. Anorexia has the highest mortality rate of any mental illness, according to statistics read at Binghamton University’s first National Eating Disorders Association (NEDA) Walk on Sunday. 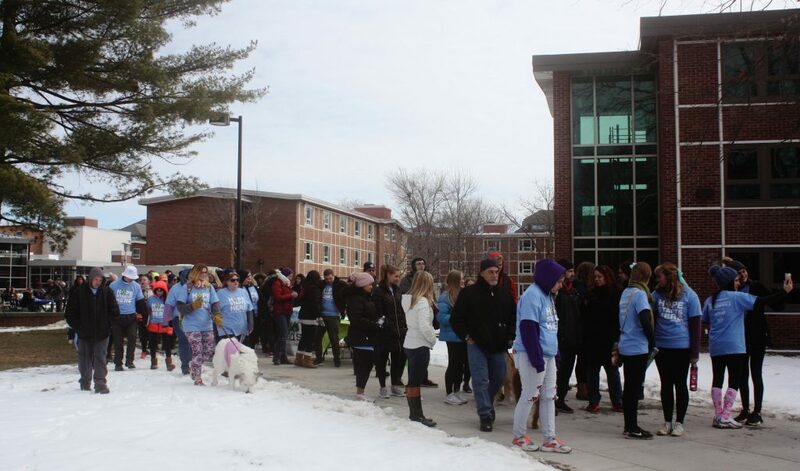 A crowd of roughly 100 students, families and dogs gathered in Old Dickinson Community to raise awareness and funds for NEDA. NEDA, a nonprofit organization that helps fight against eating disorders, has almost 90 scheduled walks this year aimed to provide resources for individuals and their families that are struggling with illnesses, including anorexia and bulimia. The walk was hosted by Active Minds at BU, a mental health organization that aims to de-stigmatize mental health issues on campus and in local communities. Radhika Gogna, a junior majoring in psychology and the events coordinator of Active Minds, said she wanted to bring the NEDA Walk to the University to show support and awareness for students battling eating disorders. “It’s really easy to feel alone in a campus like this, so I think it’s important to show the campus that if you’re going through this, if someone you know is going through this, you’re not alone,” Gogna said. According to NEDA’s Collegiate Survey Project, only about 13 percent of students at national univeristies use mental health services. According to Brendan Graney, a senior majoring in Arabic studies and a member of Active Minds, this demonstrates a real need to increase awareness on college campuses, where eating disorders are often widespread. “During this age, [in the] demographic of college students, it’s so prevalent that really any awareness in any way that we can help fight it is worth it,” Graney said. The walk raised over $5,400. According to Amy Enright, a registered dietitian for Upstate New York Eating Disorder Service and one of the speakers at the walk, funding for eating disorders is normally very lacking. Other activities at the walk included a performance by a cappella group No Strings Attached, a speech from Enright and a personal testimony by Thérèse Boyle, a senior majoring in psychology. Snehith Abraham, a junior majoring in accounting and a participant at the walk, said he chose to attend the event because eating disorders have affected those close to him. Gogna, who also spoke at the event, said her experience with her eating disorder has made her a stronger person.